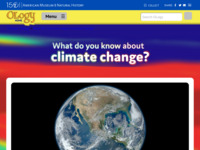 Review the resource and supporting key term "Ology" cards to become familiar with the climate concepts presented before use in the classroom. Could be used as an introduction to the topic or as a summary activity to test students knowledge. Students can also explore the links to other resources and information. This resources provides a basic introduction to understanding weather and climate, climate change, and actions young people can take to address climate change. The information is very basic but it should be noted that by clicking on the underlined and starred words the reader can learn more information. This quiz could be useful in classrooms to test students' knowledge of climate change and help them explore the topics around climate change. The 10-question interactive quiz contains key term hyperlinks and asterisk symbols to access supporting "Ology" cards to further enhance learning (e.g., definitions, descriptions, checks for understanding, fact or fiction statements, quotes from scientists, images). This resource fills the need for climate education resources for younger learners and those that benefit from adapted resources. The resource is intuitive to use. However, it is possible for the user to miss clicking on the hyperlinked terms.